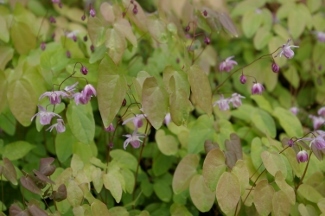 Joy Creek Photo Archive (c) all rights reserved Epimedium x youngianum 'Roseum' is a deciduous, clumping ground cover. Cut the dead foliage back at the end of winter and watch the thin stems with delicate down-facing flowers emerge. The bronzy new foliage follows soon after. Spring. 8 in. x 12 in.